Nicely furnished guesthouse in fantastic 78704 location, close to everything. In a friendly, secure residential neighborhood less than a mile from Zilker Park and Barton Springs Pool. Private accommodations include 800 sq ft 1 bed/1 bath, with large, sunny living room overlooking landscaped garden and deck, designer kitchen, full bath, private entrances. Large, sky-lighted living area includes leather sofa, 32-inch HDTV with Blu-ray DVD, stereo, wi-fi internet connectivity, and cable. Bedroom is large and comfortable with new king-sized bed, walk-in closet, clean hardwood furnishings, fresh comfy linens, double-cell insulated window coverings, clean wall-to-wall carpet. Quiet for refreshing sleep, whether you’re an early bird or wanna sleep in. 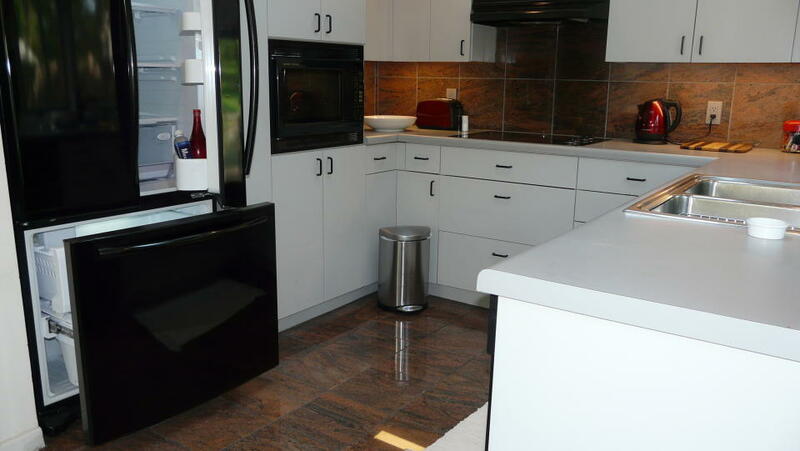 Full-sized kitchen features granite tile/backsplash and modern appliances: French-door refrigerator, convection/microwave oven, ceramic cooktop, toaster, programmable coffee maker, electric kettle, cookware and dishes. Let us know if we can provide specific extras, or take advantage of a local organics delivery service. Location provides: two short blocks to 18-hour mini-mart; one block to CapMetro bus stop; and easy walk/bike to South Lamar Boulevard, Alamo Draft House, tons of restaurants and boutique shopping, Walgreen’s and CVS pharmacies, new Twin Oaks Library. Includes off-street parking for one car. Within car2go service area, and only $10 (including tip)cab fare from Austin Convention Center, $25 from airport. $95 per night with 2 night minimum, for 1 person. $10 each additional guest with 4 guest maximum. 12pm check-out, 3pm check-in. One guest must be 25 years of age. 50% Reservation Deposit Required - must be made in advance via PayPal. Balance plus $200 Security Deposit must be made via PayPal or in cash upon arrival.